PC users know that reinstalling Windows is just one of the things that come with the territory. Maybe you're performing a clean install on your own PC to fix nagging issues, or maybe you're bringing your home-office or small-business network up to the latest version. With the pre-Vista versions of Windows, such as XP and 2000, users could easily integrate, or slipstream, patches and service packs into the OS installer files using a few command-line tools already built into the operating system. Through this method, you could put all of the latest patches right into the installer files so that they're incorporated into the OS upon a fresh install--saving yourself the hassle of downloading and installing the updates later. However, Windows Vista and 7 use new image-based installation methods that render the traditional slipstreaming process obsolete. To update a Windows 7 installation image, you have to extract the image, decompress it, incorporate the updates, and recompress the image using the proper utilities. Here's how to do it. Although Microsoft offers enterprise tools to help IT departments create their own custom Windows 7 installation images, the process for end users is much more complex and convoluted than it was with older versions of Windows. Luckily, some freeware tools can automate much of the process and make it much easier for the average PC user to create a custom Windows 7 installer with the latest service pack integrated into the OS. In addition to detailing the slipstreaming process for Windows 7 SP1 here, we're going to add another timesaving wrinkle and explain how to install the OS from a USB flash drive, which is much faster than using an installation DVD. With a slipstreamed OS installer and a properly prepared USB flash drive, you can perform a clean, up-to-date Windows 7 installation in only a few minutes. First you have to assemble your tools. You need a 4GB (or preferably larger) USB flash drive, an original Windows 7 installation disc, the Windows 7 SP1 stand-alone installer, and a freeware utility called RT Se7en Lite (also available in a 64-bit version), which gives users the ability to customize the Windows 7 installer files. I recommend using a higher-capacity USB flash drive to leave room for other installers, drivers, or applications, such as your favorite antimalware utility, graphics card drivers, or Web browser. Having all of your most commonly installed programs and drivers available on the same drive as the OS installer is another major timesaver. Note that you must use like versions of Windows 7 and SP1 for this process. A 64-bit Windows installation DVD requires the 64-bit version of SP1, for instance, and you cannot slipstream a 32-bit version of Windows 7 with the 64-bit service pack. Also, you need to perform this process on a Windows 7 PC with at least 4GB of free hard-drive space. Grab your Windows 7 installation DVD and download the correct stand-alone SP1 installer and RT Se7en Lite Beta version 2.6.0 (older versions of the utility will not work). Once you have everything downloaded and ready, install RT Se7en Lite. Then restart your system, and, as a precaution, clear the temp folder and temporarily disable your antivirus application, which could interfere with or slow the slipstreaming process. 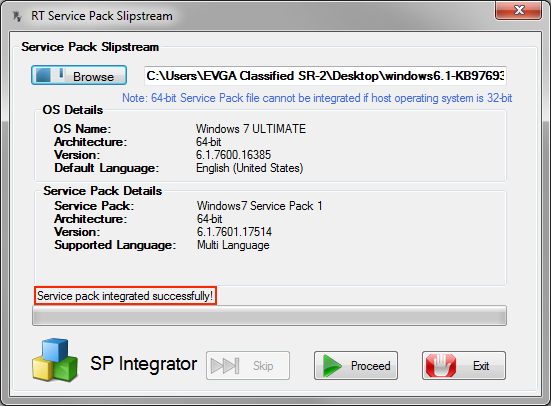 RT Se7en Lite (2.6.0 or higher) has a built-in service pack integrator that automates much of the slipstreaming process. Next, create a new folder on the hard drive, insert the original Windows 7 installation DVD, and copy its contents into the folder. (Note: The 64-bit Windows 7 DVD requires 3.01GB of space.) Once all of the files are copied, launch RT Se7en Lite. When the program opens, click the Browse button on the left and choose Select OS Path. A new window will open. In that window, select the folder on your PC into which you copied the original Windows 7 DVD. Another new window will open with a list of operating systems. Choose the same version of the OS as your original Windows 7 installation DVD, and check the box at the lower left labeled Slipstream Service Pack. Click OK, and the RT Service Pack Slipstream menu will open. Click the Browse button at the top of the window, and this time select the SP1 stand-alone installer file you downloaded earlier (windows6.1-KB976932-X64.exe or windows6.1-KB976932-X86.exe, depending on your version). Click Start. At this point, RT Se7en Lite will begin integrating SP1 into the Windows 7 installation files. The process can take a considerable amount of time, especially on slower systems. On a quad-core test machine with 8GB RAM, the process took about 15 to 20 minutes. When the slipstreaming process has completed, RT Se7en Lite will report whether the operation was successful. If it was, simply click the Exit button and close RT Se7en Lite. Upon completion the Windows 7 installer files should consume about 3.63GB of space. With Service Pack 1 successfully integrated into a Windows 7 installation image, you will have no need to download and install SP1 after a fresh OS installation.